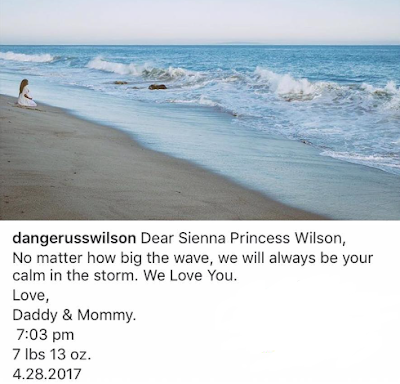 she shared the news some hours ago..
"Dear Sienna Princess Wilson, No matter how big the wave, we will always be your calm in the storm. We Love You. Love, Mommy & Daddy. 7:03 pm 7 lbs 13 oz. 4.28.2017 Photo By Daddy ❤️"
Her husband also shared the news on his page. This is the couple's first child together but Ciara has a son future jnr from a previous relationship.